(Kimberley, South Africa – October 8, 2015) – The Skateboarding World Championships at the Kimberley Diamond Cup kicked off today with the Women’s Street World Championships. Alexis Sablone (USA) topped Vanessa Torres (USA) and third place winner Leticia Bufoni (Brazil). Thursday’s competitions also included the first ever African Continental Championships, drawing skaters from 14 African countries to compete. First up was the African Continental Championships, where the small African island of Reunion dominated the competition, sweeping the top five spots in the contest. Damian Philippe led the competition, picking up first place and the African Continental Champion title along with earning a spot in Friday’s Street World Championship qualifiers. Laurent Genze followed closely behind, filling the second place spot, while Finet Thierry earned third place. The list of competing countries: Botswana, Egypt, Kenya, Madagascar, Mauritius, Morocco, Mozambique, Namibia, Senegal, Reunion, Tanzania, Uganda, Zambia and Zimbabwe. The Women’s Street Championships were the highlight of Day One and featured standout performances by Vanessa Torres and Leticia Bufoni, but it was Alexis Sablone, who ripped the entire course and claimed the Women’s Street World Championship title. The women’s championships added extra significance, with the recent news that skateboarding is among the top contenders to be considered for the 2020 Tokyo Olympic Games. This year the World Skateboarding Federation, which sanctioned the Skateboarding World Championships, provided financial assistance to over 50 skaters to help them pay for travel expenses to South Africa. WSF is committed to supporting skateboarders around the world and is leading the charge to organize skateboarding in advance of its potential inclusion in the next Olympic games. Click here for the full results from Day One of the Skateboarding World Championships at the Kimberley Diamond Cup. 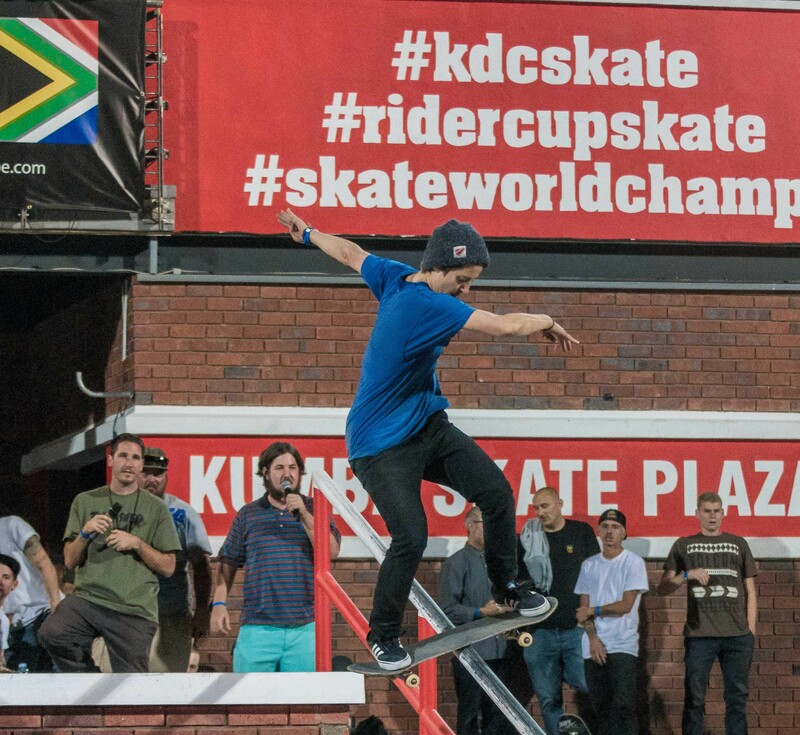 The official events of the 2015 Skateboarding World Championships at Kimberley Diamond Cup are the African Continental Championships, Women’s Street Championships, Vert World Championships, Street World Championships, Rider Cup Team Skateboarding Championships as well as four national championship events for South African skaters, including Girl’s Street Championships, Vert Championships, Street Championships and the Top Grom Championships. *SAST is South Africa Standard Time. It is 9 hours ahead of Pacific Daylight Time and 6 hours ahead of Eastern Daylight Time. For the full 2015 Kimberley Diamond Cup Schedule of Events and official roster, visit www.KimberleyDiamondCup.com. Follow KDC on Twitter, Instagram and Facebook. The official hashtags of the 2015 Skateboarding World Championships are #worldskatechamps and #KDCskate. The World Skateboarding Championships at the Kimberley Diamond Cup is a partnership between South Africa’s Northern Cape Provincial Government, World Skateboarding Grand Prix and Kumba Iron Ore. Located 300 miles southwest of Johannesburg in the Northern Cape Province, Kimberley was the location of South Africa’s first diamond mine, thus its nickname, “The Diamond City.” For the latest news and information go to www.kimberleydiamondcup.com or follow KDC on Twitter, Instagram and Facebook. World Skateboarding Grand Prix is an international skateboarding event management company. WSGP hosts world-class skateboarding events with a commitment to help stimulate local economies through tourism while supporting youth development, especially those in underserved or impoverished communities. For the latest news and information on the 2015 Skateboarding World Championships at the Kimberley Diamond Cup and other upcoming World Skateboarding Grand Prix events, visit www.WorldSkateboarding.com.